Purchasing a television in this day and time is a challenge that leaves most consumers in a quandary. A decade ago, you simply entered an electronics retailer and gazed down an aisle of televisions that looked very much the same as one another, with the exception of size and price. You were confronted with few decisions and your risks were minimal. Today, you need to do your research and the risks can be high with technology that’s moving even faster than the changing seasons. There are several television display categories to choose from. There are television projectors for those looking for dramatically large images, commanding price tags from $4,000 to $60,000. There are basic CRT television sets that range from a 20-inch 4:3 that can be had for a mere $100 to state-of-the-art HD-ready sets that range in sizes up to 70 inches and can cost up to $7,000 and beyond. Something that all of these big-screen CRT TVs have in common is that they all take up a large amount of floor space. From this space concern comes the emergence of the somewhat futuristic and, until a few years back, seemingly impossible flat-screen TV. This ultra-cool design can be hung on the wall like a picture and has freed up endless possibilities for decorating living rooms around the world. The Sharp LCD TV LC-30HV6U is a 16:9 aspect ratio, 30-inch LCD (Liquid Crystal Display) television that measures 30-5/32 inches wide by 24 inches tall and a remarkable three inches in depth. The display weighs 34.5 pounds and has a retail price of $4,500. It is HDTV-compatible and capable of displaying XGA resolutions of 1280 x 768. Unless you’ve recently awakened from a cryogenic freeze, you’ve experienced the splendor of flat panel displays. The most familiar is the plasma display. From a distance, the LCD TV and plasma technology appear similar to one another, but there are many differences. Initially, the most obvious similarity is the price, with LCD displays costing slightly more. Additionally, plasma displays are available in larger sizes with the largest of today reaching to 80 inches in soon to be released versions. LCDs are currently limited to 55 inches and below, most falling beneath 40 inches. There are several points that differentiate the two technologies. Plasma displays are very power-hungry when compared to LCD displays. Additionally, LCD displays have a much less reflective face, allowing for better viewing in heavily-lit rooms. LCDs aren't nearly as heavy or as fragile as plasmas, making them a great choice for those looking for moderately sized displays. The Sharp LC-30HV6U 30 is visually striking, with its shiny silver exterior and black accent band around the actual display window. It is capable of viewing angles of up to 170 degrees both vertically and horizontally, making it ideal for viewing in almost every possible room configuration. The Sharp LCD has a bottom-mounted speaker that is removable, which makes it work well in home theater installations where external A/V sound systems are used and the minimal approach is desired. This allows the form factor to be at its absolute minimum. And perhaps its coolest feature, a Sharp original with LCDs, a separate A/V hub that is connected to the display via a 10-inch umbilical, reducing the amount of cable that needs to be run to the display. This feature is available in some plasmas today, yet is absent from most LCD displays. Without this feature, you would need to run a multitude of cables to the display, making for a difficult installation in wall-mount applications. I commonly use “Gladiator” (DreamWorks) to evaluate video displays, as this is a fantastic anamorphic pressing. The Ridley Scott masterpiece provides many details to determine video performance in the best possible way. In the last chapters, as Maximus (Russell Crowe) seeks his long-awaited revenge on Commodus (Joaquin Phoenix) in a battle to the death, edge details are startlingly real with great edge separation. Edges are what make images look three-dimensional and the Sharp quickly established itself as the best flat direct-view display I have seen. Images are remarkably sharp and natural-looking, void of annoying edge artifacts that detract from the smoothness necessary to make the DVD filmlike. I was surprised that the contrast ratio, something that plagues flat screen displays, was quite good. Blacks in Maximus’s hair were well-defined and differentiated. There is a scene as the fight nears its end where people, visible in the theatrical version, are not evident standing in the tunnel which leads the coliseum. However, only a couple of displays make this possible. My Vidikron Vision 2 eight-inch CRT projector can clearly display this in dark viewing sessions as can the best CRT direct view displays, such as the Sony XBR, yet the Sharp’s 700:1 contrast is very sufficient and displays 99% of possible contrast-related details. Details in the windblown hair of Commodus’ sister Lucillia (Olivia Williams) as she stands above the dying Maximus are very distinct, with no visible motion-related artifacts when viewed from several feet away. Details and textures in the sand are so three-dimensional that they appear as clear as many native 1080i feeds. I was thoroughly impressed with this display’s performance. Walt Disney Pictures animated epic “Dinosaur” serves up some of the best-animated detail available today. Although animation is easier to reproduce than live images, it serves as a solid evaluation tool. In the opening scenes, where Alidar is first born, the wind-drawn detail in the fur of his newly-found mammal friends is incredibly realistic and again showcases the Sharp’s uncanny ability to make images appear three-dimensional. Over and over, this display proved to best the best-looking flat display I have seen. I was in awe of it presentation of this film from every aspect. I next loaded up the movie “Clueless” (Paramount). Although hardly a classic flick, Alicia Silverstone is adorable and this movie is downright funny. This is a good but not a great pressing, yet it represents the typical quality of many DVDs we watch and own. In the scene where Silverstone’s character Cher is getting her makeover, the flesh tones as well as the reds in her facial makeup are clear and had great color warmth. As with the other evaluations, edges are tight and smooth and images have great depth. As cool as flat displays are, they are also very expensive. 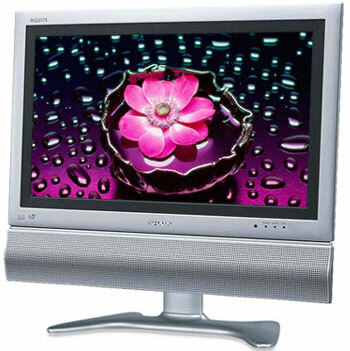 In nearly all cases, they have reduced performance over direct-view CRTs, such as the Sony XBR. The reason that you buy a LCD or plasma display is not for the ultimate in performance, but rather for the coolness factor and convenience of a flat screen. The Sharp LC-30HV6U comes with the separate A/V hub with umbilical that makes installation and cable management much more convenient, yet this display is best installed by a professional who can run the cables through the wall. It comes with a table stand but, in my eyes, if you have a table to stand it on, you have room for a larger non-wall-mounting display that is cheaper and could perform near or equal to the Sharp display. I recommend wall-mounting, thus taking full advantage of the sheer bitchin’-ness this display offers. The Sharp display does not yet come with the HDMI connectivity that makes A/V connections a breeze. This feature will be available from Sharp later this year; however, I don’t find this feature worth waiting for. Once installed, this becomes a non-issue. The flat panel displays are the best thing to happen to video in many years. As a kid, I dreamed that someday this would be possible. Although LCD is not available in the largest sizes offered by Plasma technology, LCD is better. The images are brighter, the displays are more reliable and Sharp offers one of the best the industry has to offer. Although 30 inches seems small, you must remember that this display gives you nearly 30 inches of horizontal viewing rather than older 4:3 displays that are measured diagonally. This display gives you more viewing area than my older 35-inch Mitsubishi 4:3 CRT display and many more features. This display is HD-compatible and can replace your aging painting that hangs above the fireplace. The Sharp LC-30HV6U offers tomorrow’s technology today, which makes it a solid buy. I loved this display and would someday like to put one in my home. If you own a non-HD set and want to update your décor and performance, you can do no better in value vs. performance than the Sharp LC-30HV6U. It could easily be the cornerstone of your updated entertainment world.